Home ABOMINATIONS The Europe That Can Say No? 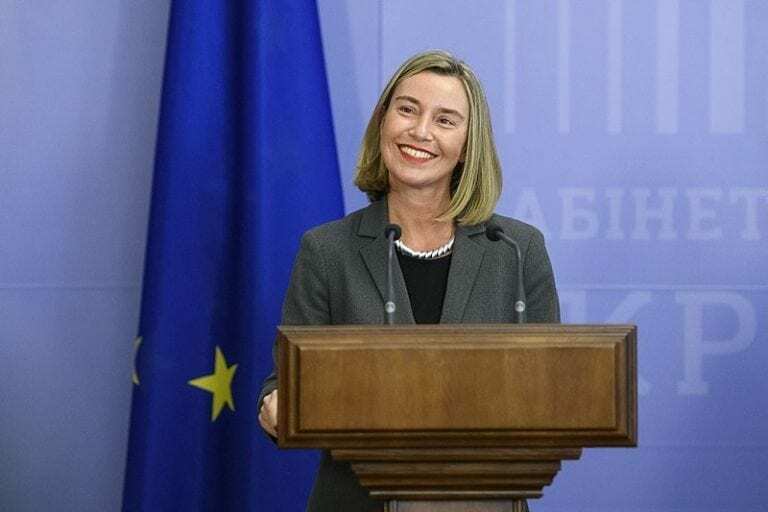 Federica Mogherini: a rare voice of reason and even hope in a continent now accustomed to vassalage. Meanwhile U.S. National Security Advisor John Bolton asks rhetorically on ABC: “Why would any business, why would the shareholders of any business, want to do business with the world’s central banker of international terrorism?” He threatens secondary sanctions on nations that, adhering to the agreement, expand trade with Iran. Some including RT commentators predict Europe will buckle to U.S. pressure and cancel contracts. But maybe not this time. Maybe Europe will become the Europe That Can Say No. Immediate work to diminish the damage done to world peace and stability by Trump’s withdrawal from the Iran nuclear agreement. According to EU Commissioner Dimitris Avramopoulus, the EU is preparing legislation to block U.S. sanctions targeting Iran. Its members know that if Iran reaps no sanctions relief from the agreement it will also withdraw, charging betrayal. France’s Total S.A. and Germany’s Siemens have indicated they may back out of contracts with Iran due to fears of U.S. secondary sanctions. The U.S. strives to use access to its marketplace to shape others’ investment options, in this case options that can lead to war. No matter that this violates the sacred bourgeois principle of Free Trade. And there are all kinds of reasons for Europe to stand up to the U.S. and say, “Your sanctions are not our sanctions.” And maybe add: Your intentions for further regime change in the Middle East are not popular in Europe, which fears more waves of refugees. And also add: The sanctions you’ve demanded we impose on Russia following the February 2014 coup in Ukraine and consequent Russian reassertion of sovereignty over the Crimean Peninsula are hurting Europe and should be lifted. There should be a multilateral world. It already exists, actually, but the U.S. ruling class, wedded as it is to “full-spectrum dominance” and notions of U.S. “exceptionalism” resists acknowledging it. Bolton’s remarks are telling. 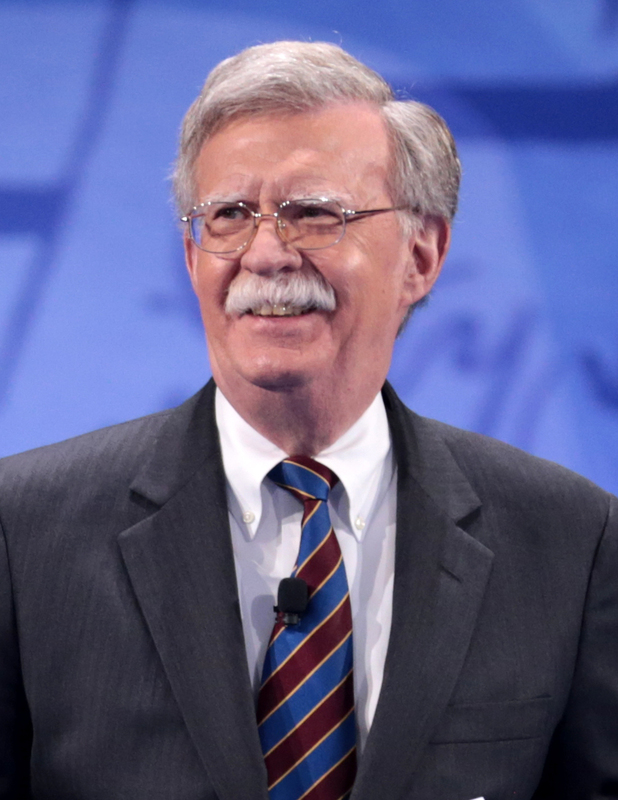 A suckup-kickdown bully, and dual nationality Neocon (Israel/US), JohnBolton is surely one of the most odious figures in modern history. “I think the Europeans will see that’s in their interest ultimately to go along with this,” he told CNN’s Jake Tapper over the weekend. Asked if the U.S. would apply sanctions to European firms, he said vaguely, “It’s possible. It depends on the conduct of other governments.” He notes legal devices available to the U.S. such as the denial of licenses. He threatens to pull out all the stops to impede the world’s effort to conciliate Iran. 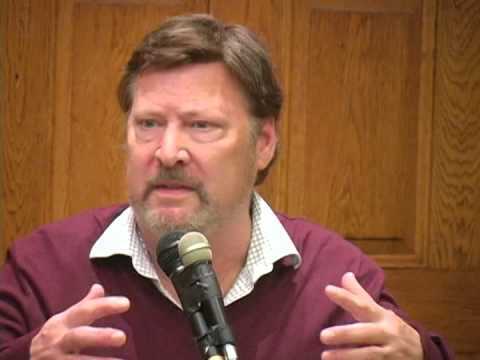 He wants to coordinate Saudi, Israeli, U.S. and MEK efforts to effect regime change in Tehran; as he told an MEK audience in July 2017, he expects this by 2019! This is the U.S. National Security Advisor, serving an unusually unbalanced, ignorant U.S. president. (The British demanded his withdrawal from the Libya talks in 2004 because he was overbearing, indeed acting like a madman.) He is saying, confidently, Europe will go along “when they see it’s in their interest.” Maybe he and Trump miscalculate. The EU even without Britain rivals the U.S. in population and GDP. If it once needed to obey, it might not need to (or want to) now. The U.S. these days does not smell of freedom, democracy, liberal values, calm reason, tolerated dissent. It reeks of white nationalism, racist exclusion, institutional police violence and murder, and seemingly irrevocable tendency towards the concentration of wealth in the .01%. It is a fundamentally unfair, unjust, unadmirable society that tortures its youth by offering them low-paying jobs and endless student debt if they were lucky enough to go to college. It denies its people the normal standard of public health care and charges them twice the Canadian fees. The EU comprises various imperialist countries who of course exploit workers throughout the world, competing in the process with the U.S. They are not morally different from the U.S. But their governments increasingly chafe under U.S. hegemony, and this particular nut-case hegemon, Donald Trump. Angela Merkel said last week that Europe can no longer count on the United States to protect it. “It is no longer such that the United States simply protects us,” she declared, “but Europe must take its destiny in its own hands. That’s the task of the future,” she said during a speech honoring French President Emmanuel Macron, who said European nations should not allow “other major powers, including allies” to “put themselves in a situation to decide our diplomacy [and] security for us.” Trump was all over this guy in his last visit but the bromance ends here. You do not order proud France to cease trade ties with Iran just because you’re looking for another war. Europeans are tired of that. Tired of being taken for granted as slavish allies when the U.S. decides to attack somebody. The Truman Doctrine is dead, the Cold War over, Europe despite Brexit increasingly united in its ability to collectively respond to U.S. pressure. Let there be an intensification of inter-imperialist contradictions! Let Germany say, yes, brothers and sisters, let us make Mercedez-Benz in Tehran! Let us sell you Airbus passenger airliners! Let us buy your walnuts and pomegranates and carpets. And let us tell the Americans the “American century” is not gonna happen. will Europe’s determination surive a false flag pointing at Iran? Wouldn’t it be a step in the right direction if the EU finally stopped bowing to the U.S./Israel neocolonial war machine, though as the author points out western Europe has greatly benefited from post-WWII U.S. militarism. Just as one can consider Israel a military base of the U.S. (with plausible deniability), one could also conceive of the U.S. as the “military base” of western European elites since the end of WWII – not only acting in the U.S.’s own interests, but also used to prop up exploitive prior colonial relationships through coups, election rigging, proxy jihadist wars, and outright invasion. Perhaps the very real prospects of an unintended ignition of WWIII as a result of continuing current U.S./Israeli policies in the Middle East, along with the difficulty of selling European publics on the sanity of following the Trump presidency into war, have created a turning point in post-WWII European policy? We shall see.